Betsy Bugg Holloway has been named Samford University's chief marketing officer, effective Aug. 1. 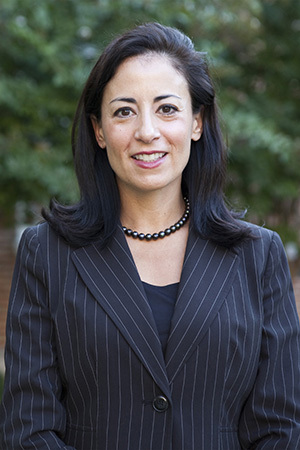 Holloway currently serves as the Dwight Moody Beeson Chair of Business, Hackney Family Research Fellow and professor of marketing in Samford's Brock School of Business. Holloway's appointment comes after a year-long study of the university's marketing needs. A task force appointed by Samford President Andrew Westmoreland recommended establishing a new office of strategic marketing to be led by a chief marketing officer. "Dr. Holloway brings a unique blend of corporate marketing and academic experience to this important new role that will enable her to help us to think strategically in all of our decisions," Westmoreland said. "I am investing in her the authority necessary for establishing and implementing an aggressive plan to promote our exceptional programs, centralizing existing resources in more effective and cost-efficient ways to have the greatest possible impact." Although Holloway will be housed organizationally in the University Advancement division, she will participate in leadership meetings across campus and will be responsible for "organizing and pushing the Samford brand," Westmoreland said. "We are fortunate to have someone with Dr. Holloway's skills and experience in marketing strategy and implementation already resident within the Samford family," said Randy Pittman, Samford's vice president of university advancement. "She has been a member of our faculty for 11 years and has served as a leader on our campus, in the business community and in national professional organizations. All of us at Samford have great respect for her, and I am pleased that she has agreed to take on this important role." Holloway is actively engaged in the marketing discipline, and her research is featured in academic journals and conferences in the U.S. and abroad. She serves on the editorial review board of The Journal of Marketing Theory and Practice and on the boards of directors for the Alabama Association of Nonprofits, the Birmingham Civic Club Foundation, the Alabama Symphony Orchestra Foundation, and BBVA Compass Bank (Birmingham, Ala.). Holloway is the immediate past president of Omicron Delta Kappa national leadership honor society, which operates on more than 300 college and university campuses around the country. Holloway earned her bachelor of arts degree from Vanderbilt University, a master of business administration degree from Samford and a doctorate in marketing from the University of Alabama. Prior to joining the Samford faculty in 2002, Holloway held several positions in international marketing and was most recently the director of international business development for Axcan Pharma, a global pharmaceutical company. "I am honored and excited to serve Samford in this new role," said Holloway. "I look forward to working alongside our leadership to advance our marketing programs and the mission of Samford University."